Legendary bluesman Robert Johnson, whose songs have been recorded by the Rolling Stones, Bob Dylan, Eric Clapton, the Allman Brothers Band and many other classic rockers, died at age 27 in 1938. Since so little is known about Johnson — who recorded barely more than two dozen songs, including ‘Dust My Broom’ and ‘Sweet Home Chicago’ in his unnaturally short life — some pretty crazy myths and rumours about him have taken hold in many people’s minds. He’s rumoured to have sold his soul to the devil, and to have died after being poisoned by the jealous boyfriend of a woman he was talking to, just as famed talent scout John Hammond was trying to hand him a one-way ticket to fame and fortune. Since so little is known about Johnson — who recorded barely more than two dozen songs, including ‘Dust My Broom’ and ‘Sweet Home Chicago’ in his unnaturally short life — some pretty crazy myths and rumors about him have taken hold in many people’s minds. He’s rumored to have sold his soul to the Devil, and to have died after being poisoned by the jealous boyfriend of a woman he was talking to, just as famed talent scout John Hammond was trying to hand him a one-way ticket to fame and fortune. 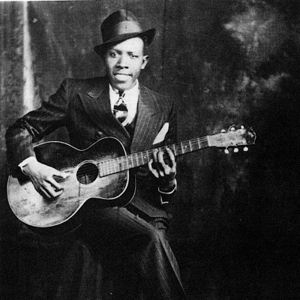 Robert Leroy Johnson (Born 8th May 1911 – died 16th August 1938). He was an American blues singer and musician. His landmark recordings in 1936 and 1937 display a combination of singing, guitar skills, and songwriting talent that has influenced later generations of musicians. Johnson's shadowy, poorly documented life and death at age 27 have given rise to much legend, including the Faustian myth that he sold his soul at a crossroads to achieve success. As an itinerant performer who played mostly on street corners, in juke joints, and at Saturday night dances, Johnson had little commercial success or public recognition in his lifetime. It was only after the reissue of his recordings in 1961 on the album "King of the Delta Blues Singers" that his work reached a wider audience. Johnson is now recognized as a master of the blues, particularly of the Mississippi Delta blues style. He is credited by many rock musicians as an important influence; Eric Clapton has called Johnson "the most important blues singer that ever lived." Johnson was inducted into the Rock and Roll Hall of Fame as an "Early Influence" in their first induction ceremony in 1986. 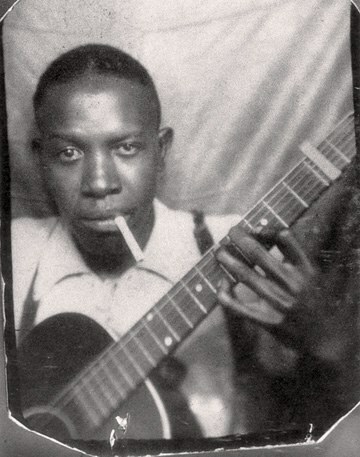 In 2010, the Rolling Stone magazine ranked Robert Johnson fifth in the list of the "100 Greatest Guitarists of All Time".